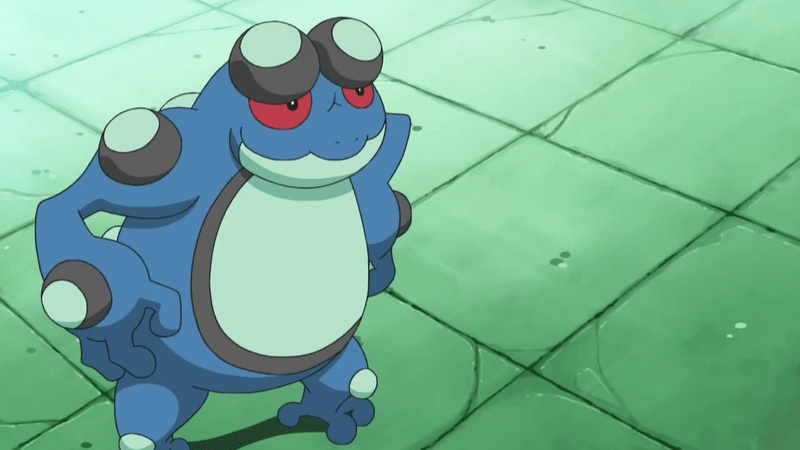 If you have gone to a Pokemon State Championship the past two weekends, you undoubtedly have played against some type of deck featuring Seismitoad EX. As you can see from the State Championship results, decks in which Seismitoad EX plays a key role have comprised approximately 43 percent of all Top 8 decks. This is down a bit from the first week, when Seismitoad EX played a key role in over 50 percent of the Top 8 decks, but the fall was expected as more players moved to counter Seismitoad decks. The biggest individual category of decks that have used Seismitoad EX are actually the Yveltal EX archetype, in which players use Seismitoad EX for an early Item lock as they build up Yveltal EX for later in the game. Aside from those, Seismitoad EX centric decks include disruption based options such as Seismitoad EX/Garbodor DRX and Seismitoad EX/Slurpuff PHF, a tank version that uses Aromatisse XY and Malamar EX and another tank version that uses Jynx FFI, and then more aggressive attacking versions such as Seismitoad EX/Crobat PHF and Seismitoad EX/Manectric EX. 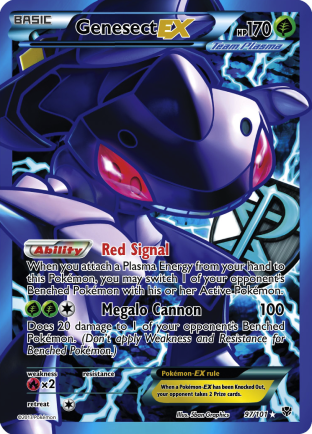 In this article I am going to look at two of the newer versions of the deck – Seismitoad EX/Crobat PHF and Seismitoad EX/Jynx FFI, and then also examine what the return of Virizion EX/Genesect EX in the meta game means for Seismitoad EX. As far as I can tell, this deck has taken down three State Championships as well as had an assortment of other finalist, Top 4, and Top 8 finishes making it one of the most successful decks of the tournament series thus far. This has been a bit of a surprise to me, not because the deck isn’t good, but because the deck has been around since City Championships and it didn’t start seeing lots of success until State Championships. Part of this might just be that Crobat PHF was still in a feeling out process during City Championships and it wasn’t really until Winter Regional Championships when players were really able to figure out how to really use Crobat well when it saw a lot of success in the Landorus EX/Crobat PHF deck. Another major factor might just be a reaction to the prevalence of Landorus EX/Crobat PHF in the early States meta and the prevalence of other Seismitoad EX decks into the meta game as this version of Seismitoad generally has a strong matchup in the pseudo mirror match. Seismitoad EX has always had a bit of a low damage output, so the Crobat line gives you supplemental damage which can accelerate Seismitoad’s ability to take prizes. 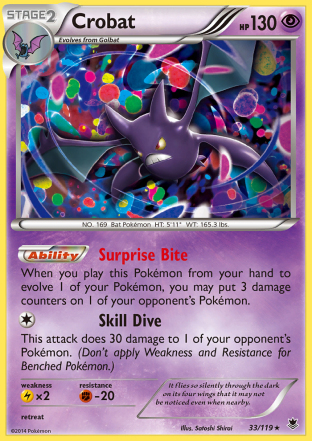 As with any Crobat deck, you really want to play a lot of games with such a deck so you really start to understand where best to put the Crobat damage to setup future knockouts. This was a new Seismitoad EX variant that came out of nowhere to surprise players during the first weekend of State Championships. Curtis Lyon took first place at the Michigan State Championship with the deck and two other players made Top 8 with the deck during the first weekend of the tournament series. The deck also took 2nd place at the Puerto Rico Provincial Championship this past weekend. What this deck does well is beat other Seismitoad EX decks. It plays a lot of draw Items to quickly go through its deck so it can get as much of a setup as possible during the first turn of the game to set itself up well very early to deal with the Seismitoad mirror matches. The way this works is that eventually it works on creating a game state in which your opponent cannot really take prizes. For example, take a situation where you start Seismitoad EX but can’t get a Muscle Band on your Seismitoad EX before your opponent uses Quaking Punch, but your opponent gets a Muscle Band down. You get two Jynx onto your field. You are taking a 6HKO on your opponent’s Seismitoad EX. 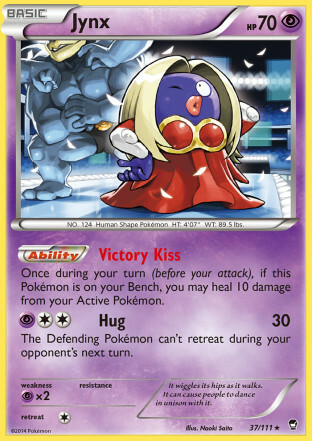 Your opponent is taking a 4HKO on yours, until Jynx is factored into the equation. With two Jynx in play, the damage output would look like this going into each players turn 50 –1–> 30 –2–> 80 —> 60 –3–> 110 —-> 90 –4–> 150 —-> 130 –5–> 180. So just on this Seismitoad you have turned a 4HKO into a 5HKO. Then you promote your new Seismitoad EX and take the KO on your opponent’s Seismitoad EX. From there, you are at a total advantage against your opponent as they presumably did not get any Muscle Band on other Seismitoad EX because they have been under Item lock since very early in the game. Your opponent is then taking a 15HKO on your Seismitoad EX and you are taking 6HKO’s and have a massive edge in the prize exchange. Against anything that isn’t using Item lock against the deck, the deck is able to heal Seismitoad EX’s with Super Scoop Up as well as play Hypnotoxic Laser to supplement the damage output. This deck is very straight forward. It has its strategy, and it just sticks to that. The deck isn’t built to play a very complex game, rather it’s built to just execute its strategy very well. While the deck borrows some components from other Seismitoad EX based decks its such a large departure from them that it’s very impressive of the players who built this to have come up with a list like this. I think this deck is very much a flash in the pan deck, however, and that it won’t see very much success going forward. The deck doesn’t have great answers for Primal Kyogre EX or Virizion EX/Genesect EX, so it will have a more difficult time doing well moving forward. It was very much just an anti-meta deck for the Week 1 meta, and since then the meta has been changing to where it will be much less effective. However, it is worth noting that the Jynx strategy got incorporated into some other decks that use Seismitoad EX, such as Yveltal EX during the second week of State Championships. Some of the most successful decks from the first weekend of State Championships were Seismitoad EX decks, Yveltal EX/Seismitoad EX, Primal Kyogre EX and Primal Groudon EX. All of these decks have primary Pokemon that are weak to Grass which allowed Virizion EX/Genesect EX to become an effective meta game counter for Week 2. Virizion EX/Genesect EX decks managed to win three State Championships in Week 2 and took a total of 14 Top 8 spots. With Virgen back as a major meta game player I would expect that the number of Seismitoad decks that see play in Week 3 and 4 will be lower than the numbers that saw play in the first two weeks. Still, I expect Seismitoad EX to maintain enough of a presence that players shouldn’t be running to play their Rare Candy based Stage 2 decks that lose to a single Quaking Punch. Seismitoad decks will need to be built with Virgen in mind if they wish to do well moving forward. Most likely this just means adding Fire techs back into Seismitoad decks to even up the Virgen matchup. In Seismitoad EX/Slurpuff PHF, for example, Victini EX saw a lot of play during Winter Regionals, so I would expect that to make a comeback. My personal favorite Fire tech is Charizard EX as it can be splashed into Seismitoad EX decks without compromising the Energy line. I think it can be played in both Seismitoad EX/Garbodor DRX and Seismitoad EX/Crobat PHF as an effective Virgen counter. 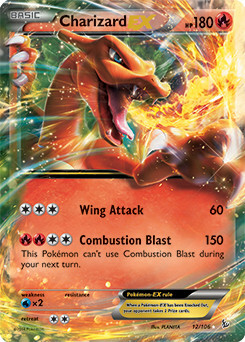 Charizard EX’s Wing Attack does 60 damage for [C][C][C], which becomes 80 damage with a Muscle Band and 160 damage against Fire weak Pokemon like Virizion EX and Genesect EX. In decks with Garbodor, Charizard EX can take OHKO’s against Virgen by shutting off Verdant Wind with Garbotoxin and then get the last 10 damage with Hypnotoxic Laser. The Crobat version of Seismitoad can use Golbat or Crobat to get the last 10 damage that is needed. I think Seismitoad EX/Garbodor DRX could be a sneaky play for the next couple weeks of State Championships. 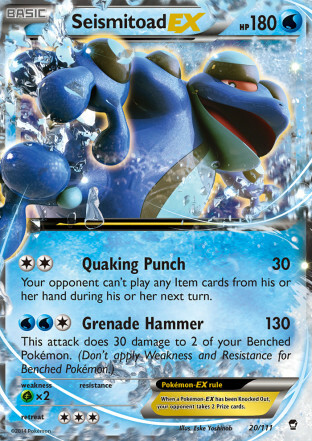 The deck is the worst of all the Seismitoad decks in the mirror match, but if other players flock away from Seismitoad EX because they’re scared of Virgen and Primal Kyogre EX then all of a sudden the mirror match isn’t something you have to worry about and outside of the mirror match, the Garbodor version of the deck has always had the strongest matchups of all the Seismitoad decks. I think Charizard EX has always worked the best with the Garbodor version of the deck as well. 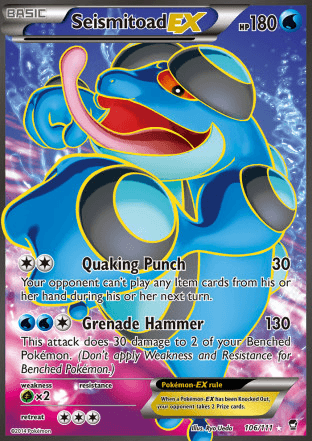 By shutting off Verdant Wind, you can usually take at least one knockout with Seismitoad EX, and then with Head Ringer and Crushing Hammer hitting the Genesect EX, it can be very difficult for them to respond to a Charizard EX scoring OHKO’s every turn against the deck. If you haven’t checked it out yet, you should check out Team Fish Knuckles YouTube Channel. The channel has a lot of great coverage of State Championships with lots of interviews of the Top 8 finishers as well as weekly Q&A sessions ahead of a weekend of tournaments. Here I’m going to embed some videos discussing the two decks I talked about in this article. The first interview is with Sorina Radu who took 3rd place at the Missouri State Championship with Seismitoad EX/Crobat PHF. The second interview is with Curtis Lyon, who took 1st place at the Michigan State Championship with Seismitoad EX/Jynx FFI. Seismitoad EX has undoubtedly been the most successful individual card during the first two weekends of State Championships. With all of Seismitoad EX’s early success, decks that counter it such as Primal Kyogre EX and Virizion EX/Genesect EX have been able to gain footing in the format, as Seismitoad EX has hated out some of those deck’s worst matchups such as Night March out of the meta. It will be interesting to see if Seismitoad can carry over its early success to the last two weekends of the tournaments by making adjustments to deal with Virgen, or if Virgen will help hate Seismitoad out of the meta, leading to decks like Night March coming back, which would just create a meta game loop where Seismitoad EX would have to come back to squash out such decks.